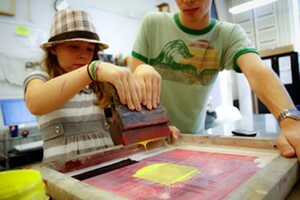 Love Can Be Corny | Home Cookin' | Kids VT - small people, big ideas! Valentine giving — and getting — is upon us. Will you say it with flowers, chocolates or a greeting card declaring love and affection? As with most things, homemade Valentines are better, and edible homemade Valentines are best. Tossed with pretzel bits and candy-coated chocolate pieces in red, pink and white, this caramel corn makes a sweet-and-salty gift to share with your child's classmates. Just pour the mix into cellophane bags and tie with red and pink ribbons to rival any store-bought treat this Valentine's Day. Grease an 11-by-17-inch baking sheet (or line with a silicone baking mat). Combine popcorn and pretzel pieces and spread across prepared baking sheet. Set aside. In a large saucepan over low heat, combine butter, brown sugar, honey and salt. Once the butter melts, let the mixture bubble and cook for another 3 minutes. Remove from heat. Whisk in vanilla and baking soda. 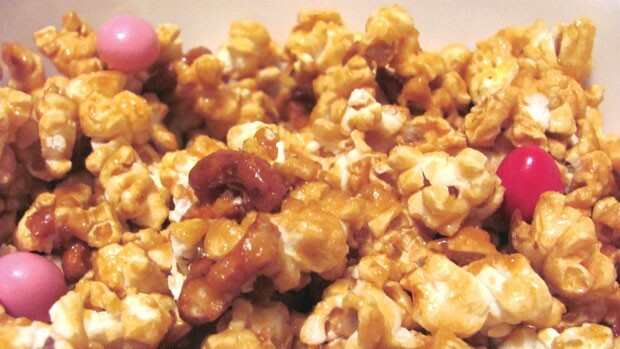 Immediately pour caramel mixture over popcorn and pretzels. Using a spatula, toss the popcorn to coat. Bake in preheated oven for about 20-25 minutes, stirring every 10 minutes. Let cool, then break into pieces and toss with chocolate candy. Store mix in an airtight container or package for Valentine giving.